We are so excited to have launched a mini-series of fine art photographs of Bahamian beaches. I have had my eye on Bahamian Beaches, specifically Harbour Island & the Ocean View Club for over a year and desperately wanted to include images of the sea in our home collection. We finally jumped at the sudden opportunity to spend a few nights there earlier this month and are so glad that we did! I’ll hop around a bit as I share some “behind the scenes” images. 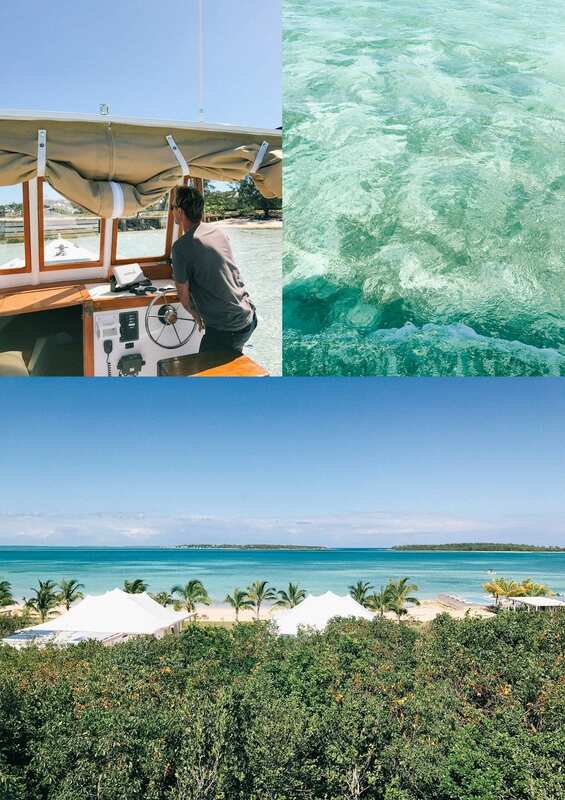 The snaps below are from Day 3, which we spent on Eleuthera touring the Other Side, the latest venture to be developed by our hosts, Ben & Charlie, at the OVC. It is a sustainable hotel concept, using the sun’s energy to power seven luxury “tents.” These are mostly iPhone images; they provide a peek at the new property in the final stages of development: Chad, the OVC’s “permanent resident” (he came as a guest and never left, is incredibly resourceful and has helped to set up the property), picked us up by boat and gave us a tour of the property. The hotel is sited on the beach but stretches up to the hill with spectacular views of the sea below. The color of the sea is an extraordinary crystal clear aqua that seems to issue a constant and mesmerizing invitation to jump in! Below is a snap of the palm-lined path to the salt water pool and some passing shots of interiors. Ben took great pride in ensuring that all the furniture was made by local craftsmen. The rooms are simply furnished, but every detail is so carefully executed that the “tents” radiate peace, beauty and a timeless elegance. I took pictures of the stunning tables in the rooms to see what inspirations we could bring back and re-create for our home and office. Another simple yet clever idea was Ben’s decision to line all the tents with plants, thereby seamlessly inviting the outdoors in and allowing guests to feel sheltered from but still part of the natural beauty surrounding them. I cannot WAIT to go and stay; it has just opened so we will be back as quickly as possible! The entire property is so peaceful and quiet it feels like a remote paradise, and it is hard to believe it is on Eleuthera, an island with an airport and, thus, easily accessible. The hotel is also small enough to fill with friends and family — how much fun would that be?? While parents relax, children can run around in safe and blissful surroundings! After our tour, Chad handed us the keys to Ben’s Moke, the cutest and coolest way to continue our exploration of the Island. We crawled along (at five miles per hour! ), anxious to return his characteristic generosity with the kind of photographic record that the Island’s beauty so richly deserved. Some beach shots in the series that we have produced for you were taken that day and are only a glimpse of Eleuthera’s staggeringly unspoiled shoreline. Here is a photo taken while lunching at the delicious Ocean Tally; it was so nice to sit and have a glass of rosé while watching the waves crash into the natural pool below: We returned to the hotel for a quick swim before heading back to Harbour Island to photograph yet another spectacular sunset on Bahamian Beaches. Hi Lucy! I really love the photos you take. It’s so dreamy! I am looking to buy a new camera, may I ask what kind of cameras and lenses do you use? Would really appreciate if you take time to reply : ) Thank you! I am so sorry for my delay here — I use a lot of cameras: a contax 645 (medium format film), a cannon miii and a leica M — I love my large iphone 7+ too!! Hi Lucy! I love all the photos you take. It’s so dreamy! I am looking to buy a new camera, may I ask what kind of cameras and lens do you use? Would really appreciate if you could take time to reply. Thank you! !